Top ten (or 11) things I love about a blizzard . . . I know this isn't what you expect to read from someone on a farm during a blizzard, but there are some amazing things I really appreciate about a good snowstorm. . .
1. Snow days for the kiddos - duh. Any day my kids don't have to go to school or to any of their multitude of practices, social engagements, or other activites is a great day! The snow slows things down, muffles the noisiness that comes with the busyness of life with a teenager and almost teenager, and this mom treasures those days. When they were babies, the days went by slow, but the weeks went by fast. Now it just all goes by fast, and I'm trying to savor every minute of it. 2. That Bruce and I can focus on the basics - taking care of our family and the 200+ creatures that depend on us. Life gets simple during a storm, and it's pretty great. 3. That the forecast shows above freezing temps by Sunday and 40+ degrees on Monday. Short blizzards are the best blizzards! 4. That the horses have the cleanest feet ever when they come in from playing in the snow! Several inches of snow beats 38 degrees with rain and mud every day of the week when you have horses who need their play time outside. No fungus, no thrush - just beautifully clean hooves. This goes for the cows, too. Mud or hard frozen ground is rough on our girls, but a foot of snow is soft and clean! 5. Rambo blankets. Yes, they are expensive, but when your husband says, "those Rambo blankets are just the best," you know they are worth it. The snaps at the chest, the strong velcro, the buckles that work, the lack of need for leg straps, that I don't have to take my gloves off to get them on and off, and the horses are always dry underneath - perfection in a blanket! 6. In conjunction with #5, my brilliantly simple blanket rack in the barn that lets me hang each snow covered blanket to dry so they are always ready to go again the next morning. It is the little things that make life so much easier, and I appreciate my blanket hanging rack every time it rains or snows! 8. Frost free hydrants and generators = peace of mind. 9. That the horses practically purr with appreciation for their warm mashes when they come in for dinner. 10. That Fizzie, at nearly 30 years old, has the best winter coat, best feet, and healthiest weight he's had in the 8 years he's lived at Sally Run. Other than worrying that his tongue might get frost bite because his front teeth are no longer long enough to keep it in his mouth, I don't walk into the barn scared he's had his last days with us like I did a year ago. 11. That Glory bug doesn't have to wear her muzzle when the ground is covered in snow. (She asked me to put that one in here because it's a really big deal for her.) With our warm, wet fall, she has spent an unusual 10 months wearing her muzzle (and she miraculously still lets me get near her to put it on each morning and doesn't even try to bite me). Not only can she now eat hay like a normal pony, but she can also up her bossiness by using her teeth to terrorize her adoring geldings. All good things according to her. So that's my immediate list - oh, and that I can drink as much tea as I want without feeling like I have an addiction because it is really, really cold out there! Stay warm and safe everyone!! A long overdue update . . .
Life moves fast at Sally Run!! With one of my babies finishing up her first year of high school and the other one heading to middle school in the fall, we feel like time is truly flying by! On the horse front, things are only mildly less crazy. As most know, I lost my precious Barney last summer to complications from EPM. It was so heartbreaking, but I was relieved to not see him suffer anymore. We were able to bury him under his favorite tree, and I am grateful to have been able to give him a comfortable life for his last years. On the more positive side, I am sharing my red head, Dutchie (Three Times) with the uber-talented and super adorable junior rider Kristin Counterman. Having just missed competing for Region 1 at the NAJYRC last summer, she started riding Dutchie in the fall with hopes of making the team this year. 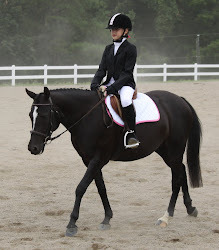 They are off to a fantastic start, scoring nearly 70% at their first outing this past weekend! I am very hopeful that I will be making the trip to Kentucky to cheer on a super kid and a super horse! Since Kristin is based in NoVA with Lauren Sprieser, Dutchie is staying there, and I am commuting Wednesday-Thursday a couple of times a month to ride and also visit my dear college friend and god-babies in The Plains. So, poor Glory is really missing Dutchie since she is the only thing I have to ride at home these days! After about three days of dressage, she gives me a good head shake to let me know she needs a hacking or jumping day (and then proceeds to give me a few cheerful bucks to say thank you). On the cow front, we also lost our oldest mama cow, Mousey, who we know was at least 16 years old. Thankfully, she passed very peacefully and is also now buried at Sally Run. But back to the positive, we have had a good calving season so far, and the kids are loving raising a little heifer calf who was a twin. Spring has certainly arrived, with warmer temperatures, lush green grass and trees budding. Glory was less than cheerful to receive her annual gift of a new muzzle, but her girlish figure (and good health) become immediately endangered at the first signs of new grass! Caruso had the huge honor of giving our friend, Alexia, from Italy her first ride on a horse EVER! It was a lifelong dream of hers to ride a horse, and after her first visit to the farm, we agreed on a day for her to ride. After a full week of upper 60s, the temps dropped well below freezing on the appointed day and the wind started gusting at 30 mph. Those who know my Caruso from years' past might remember that high wind is not really his thing. However, rising to the occasion and, at 19 years old, acting like a super sane, grown up horse, he proved once again what a star he truly is. His coat was still quite velvety (he's always had the best hair), and I had bathed him earlier in the week, so he looked quite handsome and let Alexia play cowgirl to her heart's content. Among many funny comments and questions, my favorite was, "Is he a little bit bigger than normal horse?" She wanted to ride Glory when she first came out, so the jump from a pony to 17 hands was a big one! But Caruso has quite the history of being the most photogenic in the barn, and Alexia now has several great pictures to take home to her husband in Italy to convince him she needs a horse! So, we're heading into the home stretch of the school year, and I've finally realized that life never slows down. Summer is already jam-packed, but it is all fun, and I wouldn't trade these precious years with our kiddos for anything! I hope our horse and farm friends are all doing great and that everyone's families and animals are all healthy and happy! Come see us on the farm! Sorry for the delay in getting a clinic schedule out to you – we’ve had a few changes in the last 24 hours!